As someone who has been interested in the area of voter turnout since commencing PhD researches on this topic back in…gulp…1999 and as a geographer, I am always interested in attaining turnout data for very small areas/at a sub-constituency level. While constituency level turnout analysis/maps can uncover interesting trends and point towards certain factors impacting on these, there are however only a small number of these (forty-three general, or Dail, election constituencies at presenting, falling to forty following the next general election) meaning that any analyses of turnout at this level faces issues to do with small-numbers problems. It is also the case that the really interesting turnout geographies occur usually at the sub-constituency level and there can be significant variations in turnout levels within a single constituency – analyses of such geographies/trends can offer a deeper understanding of what factors are shaping/influencing turnout propensity and can add to/complement individual level studies of turnout behaviour engaged in by those in the field of political science. In this post I am going to look at turnout in the six Dublin City constituencies at the electoral division level for the last referendum prior to last weekend’s Children’s Referendum. This study is based on my own geographical analysis of the excellent turnout by polling box figures that the Dublin City returning officer makes available from their own website, involving the calculation of electoral division level turnout figures based on these and the mapping of these figures (as in Figure 1 below). The map of voter turnout (Figure 1) for this election shows a similar geography to that of other previous electoral contests, as can be evidenced with reference to a recent previous post on Dublin City voter turnout levels at the electoral contests held during 2011. 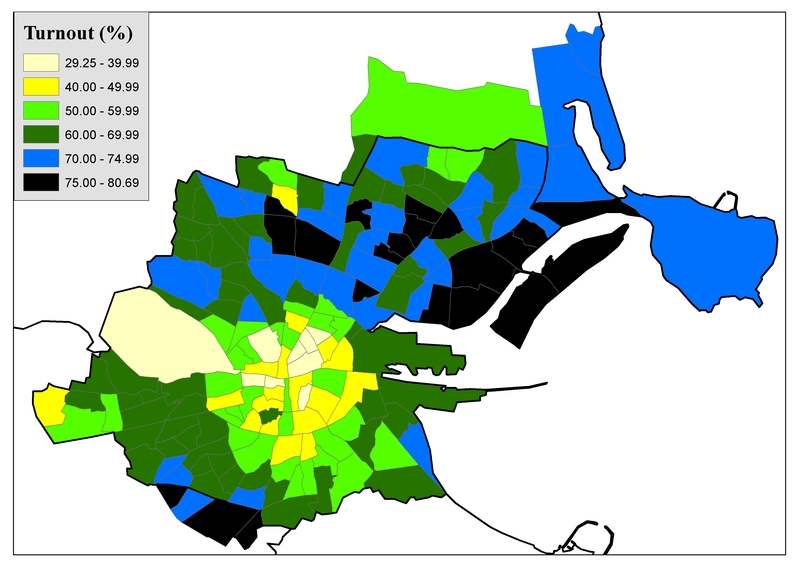 The areas with the most notable concentration of low turnout electoral divisions is again the Dublin Inner City, as with the electoral contests held during 2011 and indeed as with all electoral contests held during the Celtic Tiger and post-Celtic Tiger eras, namely the late 1990s and 2000s. The Dublin Inner City has proven to be THE low voter turnout area nationally, as well as within the Dublin region, at all electoral contests held over the last decade. This is because high levels of the different factors associated with low turnout propensity tend to be found in the inner city area, such as rented housing, residential mobility, social deprivation, single people and younger mobile populations. The level of non-voting behaviour in the inner city suggested by this map is inflated somewhat by the fact that it was not possible to exclude those on the register who could not vote in this election (i.e. all those who are not Irish citizens) from the polling box electorate figures. But previous analyses in which this has been possible to do all consistently also point towards a sink of low voter turnout levels focusing around the inner city areas. 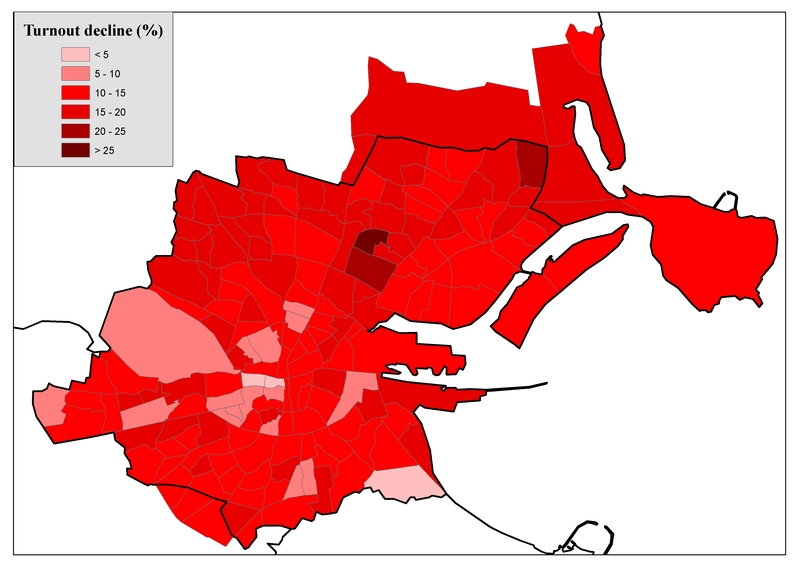 The other low turnout areas highlighted in Figure 1, as with other previous studies of turnout in the Dublin City area, include the working class areas of Ballymun and Cherry Orchard, as well as the Northern Fringe area in the north-east of the map and the Rathmines flatland areas. (The Phoinex Park area (Phoinex Park electoral division) also emerges as a low turnout area.) By contrast, the higher turnout areas tend to be mainly middle class and settled (i.e. high levels of residential stability) areas, including Portmarnock, Clontarf and Glasnevin areas in the northern part of this area, as well as the areas around Terenure and Templeogue in the southern part of the map. The linking between relative levels of affluence and turnout propensity is underpinned by a comparison between the turnout map and the above map showing a division of Dublin into different social areas, based on the calculation of relative levels of affluence drawn from a factor analysis by Adrian Kavanagh of affluence/deprivation related variables drawn from the 2011 Census. 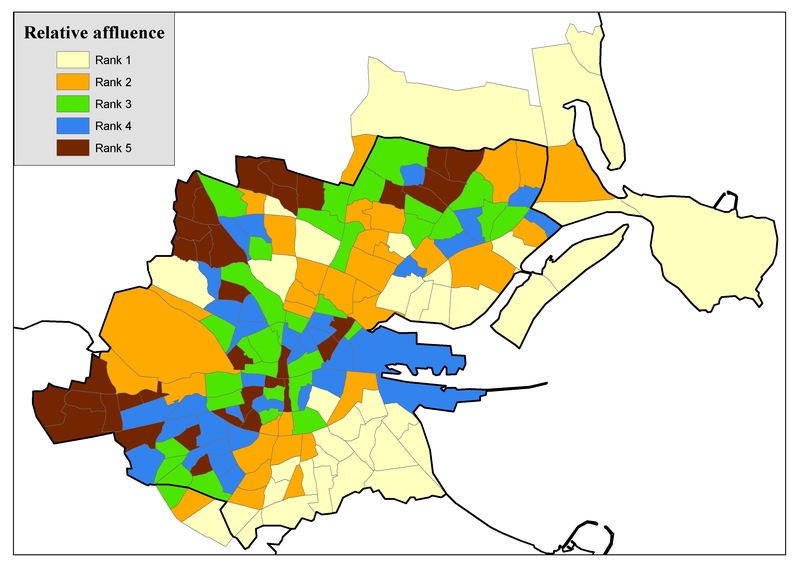 This is a rather different/simpler way of analysing/representing different levels of affluence/deprivation within an area to the 2011 Pobal HP Deprivation Index, which is discussed in more detail in this post on the Ireland After NAMA website. Figure 2 above divides the Dublin City constituencies into five different social areas. Rank 1 areas prove to be the most affluent 20% of electoral divisions within the Dublin City constituencies and the Rank 2 areas are the next 20% most affluent electoral divisions, with the Rank 5 areas including the 20% least affluent (or most deprived) electoral divisions arising from this analysis. A quick comparison of the two maps (Figures 1 and 2) suggests a strong link between social well-being and turnout propensity for this electoral contest (and the same can be applied to previous electoral contests) with Rank 1 areas tending to be associated with higher turnout propensity and Rank 5 areas with lower turnout levels. This linkage is made even clearer in Figure 3, which shows average turnout levels by social area for the recent general and presidential election contests, as well as for the Fiscal Stability Treaty referendum vote, as seen below. 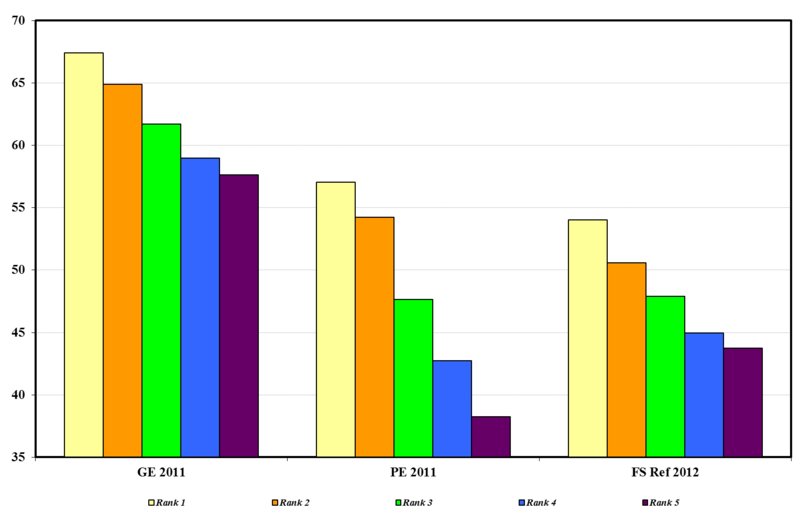 Figure 3 shows that the more affluent areas constistently tend to have the higher average turnout levels for each of the different contests, with turnout propensity decreasing in line with reduced affluence levels. What is interesting to note here is that turnout levels for the presidential election in 2011 tended to be more sensitive to class differences than those in the general election held during the same year (as was discussed in a previous post on this topic) but the same acceleration of turnout decline for the lower ranked areas is not as evident in the case of the Fiscal Stability Treaty referendum. This is an interesting finding, given that the previous findings of my researches on turnout differences between turnouts in general election and referendum elections have tended to prove that class-related turnout differences tend to be more evident in referendum contests than they are for general elections (and also local elections). This is further illustrated by Figure 4 below, which shows a relatively similar trend in terms of turnout decline between the general election and the referendum vote across the Dublin City constituencies area, with no notable spike in turnout decline in the more working class areas being evident. Does this mark a trend towards relatively higher turnout propensity amongst the more working class areas for referendum elections, or could this be a “one-off” relating specifically to the nature of the referendum issue? It is hard to say, but a similar analysis of turnout levels in last weekend’s Children’s Referendum may go some way towards answering that question. I hope to engage in such an analysis as soon as I can after the voter turnout by polling box figures for that election are made available from the Dublin City returning officer’s website. 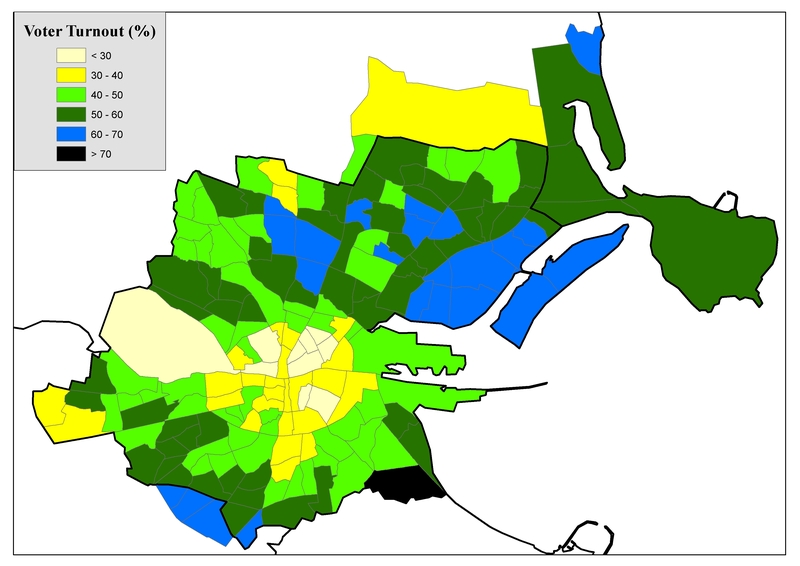 This entry was posted in Referendum elections, Voter turnout and tagged 2012, Dublin Bay North, Dublin Bay South, Dublin Central, Dublin North West, Dublin South Central, referenda, voter turnout. Bookmark the permalink.